Here is a brief description of the available pools and options. Each week, players enter by guessing the winner in each of the week's games. Whoever scores the highest in that week wins. Players are also asked to guess the total number of points that will be scored in the Monday Night game (or whatever the last schedule game of the week is). In the event of a tie, the player or players who guess closest to that total win. 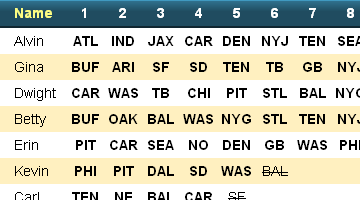 You can choose to use point spreads, in which case players must pick teams to win against the spread, rather than straight up. You can also choose to use confidence points, where players must rank each pick from one to however many games there are that week. 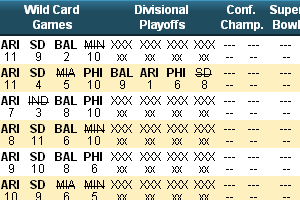 Players are scored by totaling the points assigned to each correct pick. You can choose to reserve a portion of each week's pot to go towards an overall award given at the end of the regular season. 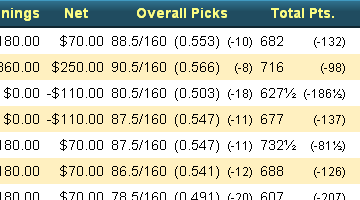 There are one or two awards, the first going to the player with most total correct picks. If you use confidence points, there is a second award for the player who scores the most total points. You set the amount as a percentage of each weekly pot. The size of the award will depend on the total number of entries for each weekly pool. When using confidence points, you can specify how this total award will be split between the two categories (correct picks and total points). For example, you can split them 50-50 or give 60% to the player with the most points and the remaining 40% to the player with the most correct picks. Should more than one player tie for one of these awards, it is split evenly among them. 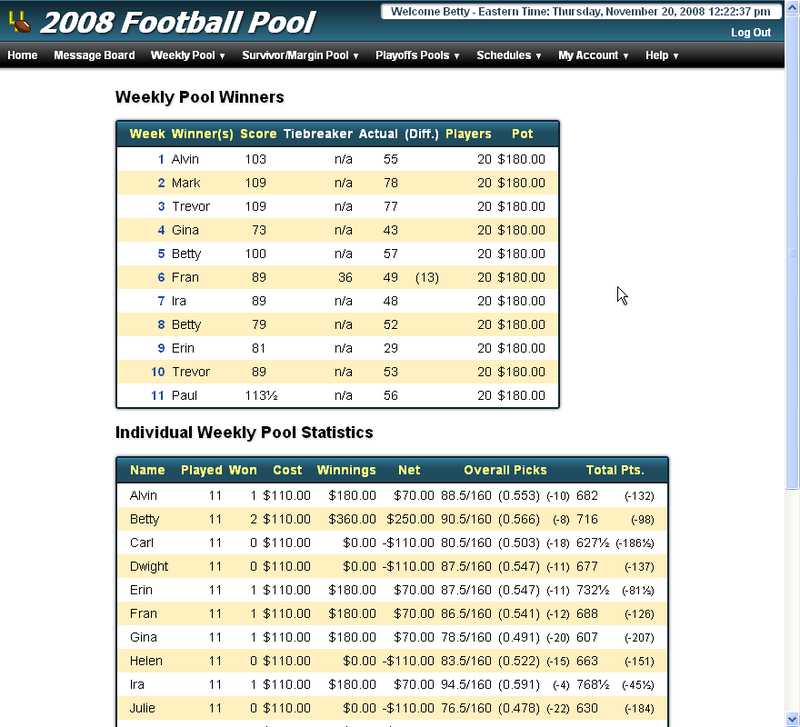 This pool is separate from the weekly pools and runs the length of the regular season. In either pool (or in the combined pool) players are asked to pick one team each week and cannot use any team more than once. Each week, if a player's chosen team wins, the player continues on to the next week. If the player's chosen team loses, the player is eliminated (you can choose whether to count a tie game as a win or a loss). The last player left standing wins. Should all active players be eliminated in a given week, they are automatically reinstated and continue on to the next week. If more than one player survives the entire season, the number of correct picks is used as a tiebreaker. 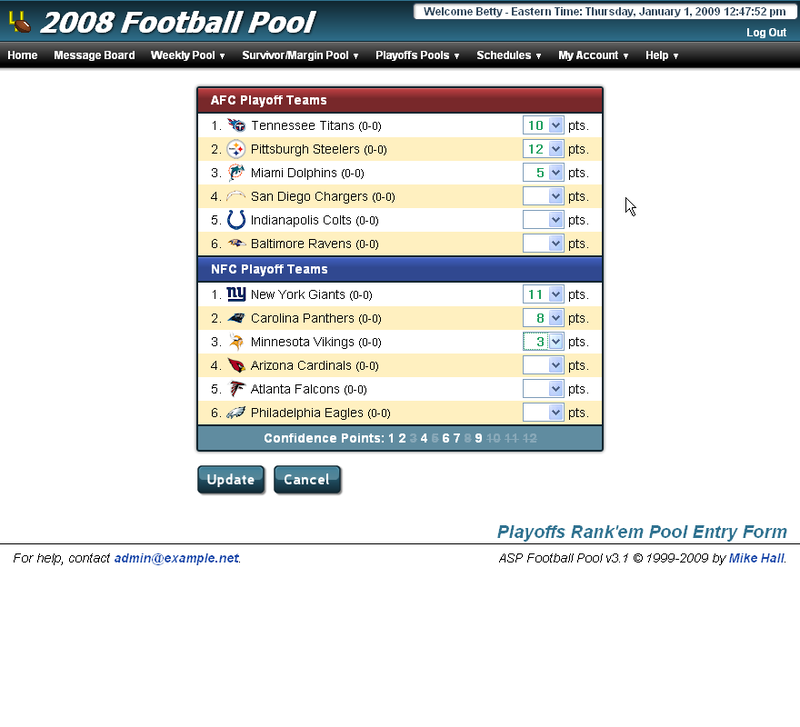 If desired, you can configure this pool to allow two or more losses before elimination. It also supports buybacks, where eliminated players can get back into the pool for a fee. Unlike the survivor pool, players are not eliminated for losing picks. 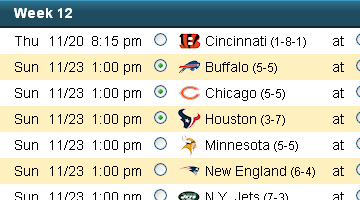 Instead, the goal is pick the team that will win by the most points each week. When a player's team wins, the number of points the team won by is added to his or her total. When a team loses, the player's total is deducted by the number of points the team lost by. The player with the highest total score at the end of the regular season wins. Should two or more players tie for the highest score, the number of correct picks is used as a tiebreaker. Optionally, you can choose not to deduct points for a losing pick. Instead, the player will receive zero points for that week. You can also combine the survivor and margin pools. Players pick one team each week and that team is used in both pools. 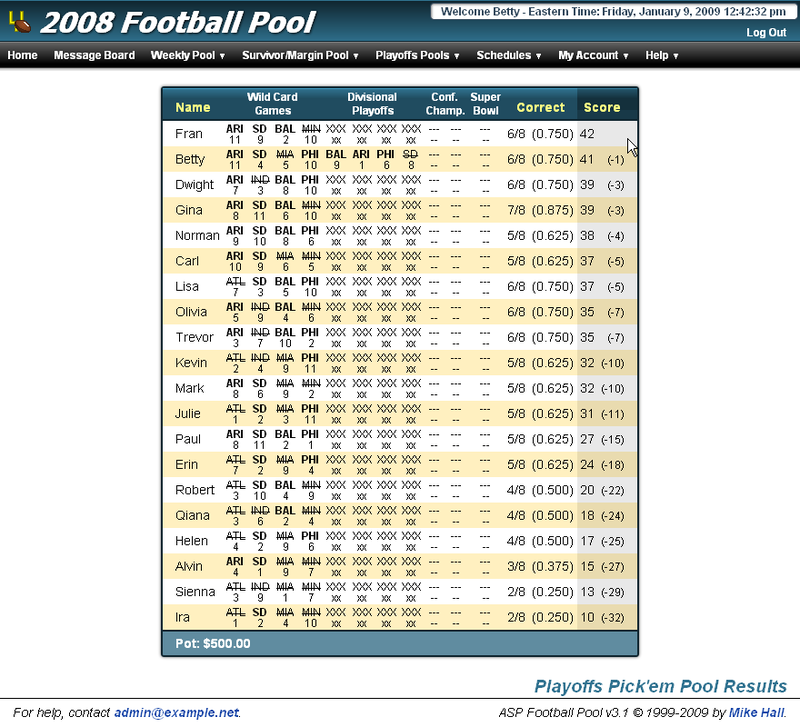 Even if a player is eliminated from the survivor pool, he or she continues making picks for the margin pool. You can specify how to divide the pot between each pool. For example, you might award 75% to the winner of the survivor pool and give the remaining 25% to the margin pool winner. If you allow players to buyback into the survivor pool, those fees are not included in the split. Instead they are added to the calculated survivor pot. 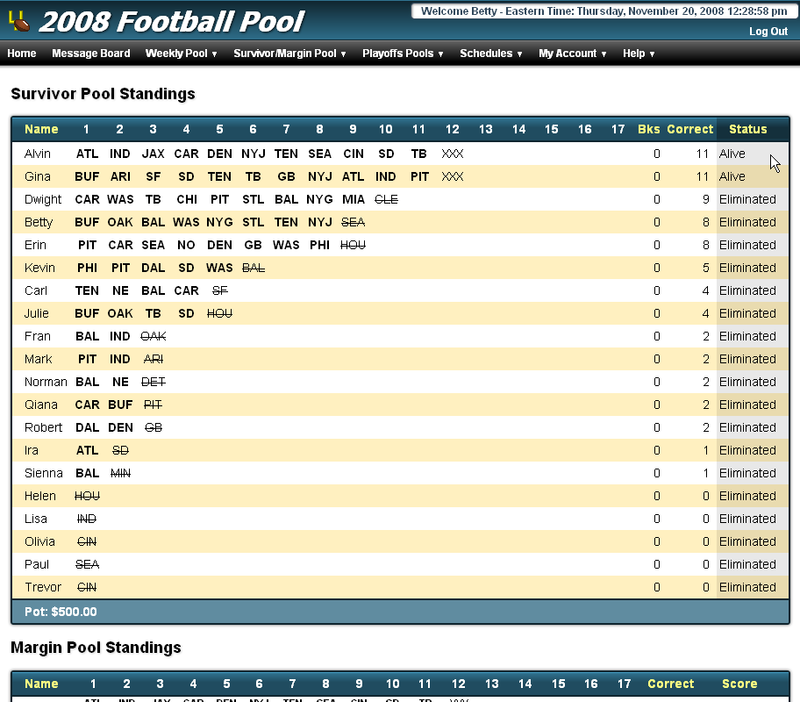 Note: By default, the survivor, margin or combined pool begins on the first week of the season. You can set it to start on a later week, if desired. There are actually three separate playoffs pools. You can run any combination of these you like. Note that there is no tiebreaker in any of these pools, players tied for the highest score will split the pot evenly. 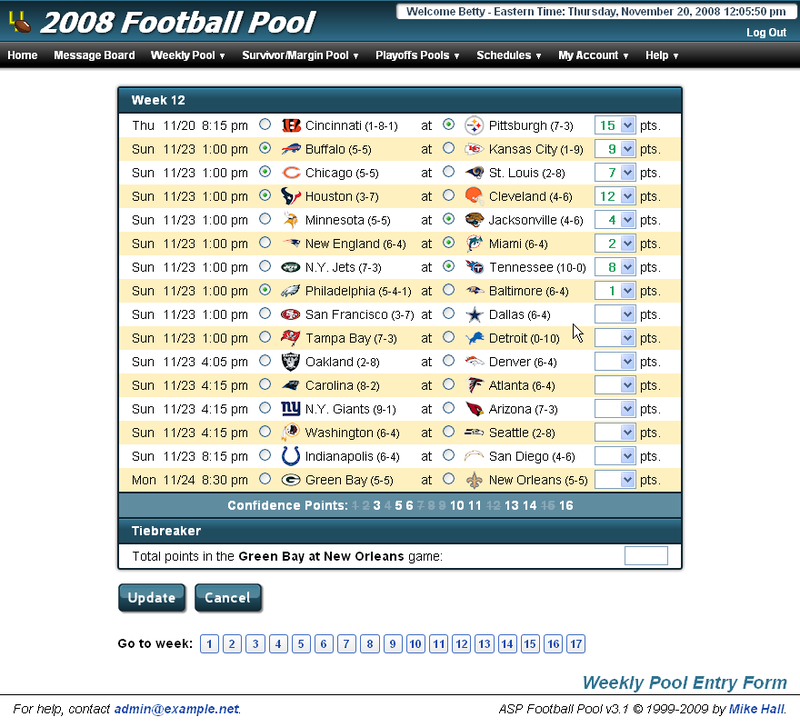 This pool is similar to a weekly pool except that it covers all the postseason games. If point spreads and/or confidence points were used in the weekly pool, they will be used in this pool as well. For this pool, players rank each of the playoff teams using confidence points. 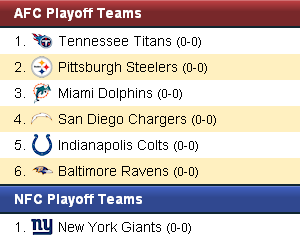 These ranking must be submitted before the first playoff game starts. Everytime a team wins a playoff game, players have whatever points they've assigned to that team added to their total score. The player with the highest total score after the final game is played wins. 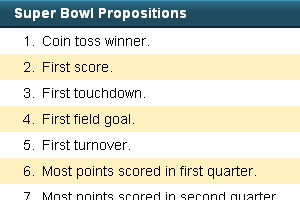 This one is based on propositions, specific statistics and events concerning the big game. Players answer a series of questions in the form of "which team will:"
The player who gets the most correct wins. Over two dozen different propositions are provided by default but as the Administrator you can add, remove or replace any of them with your own. Email notifications: Players may choose to receive email updates on scheduling changes, score updates, announcements, etc. Team themes: Users can personalize the site based on their favorite team. Quick picks: Allows players to set their picks based on different criteria like the point spread or their personal team rankings. Online payments: Lets you accept online payments via PayPal. Payments are automatically credited to player accounts. Live scoreboard: Adds a live scoreboard display to the site. Also allows the Administrator to load game scores from an online source. 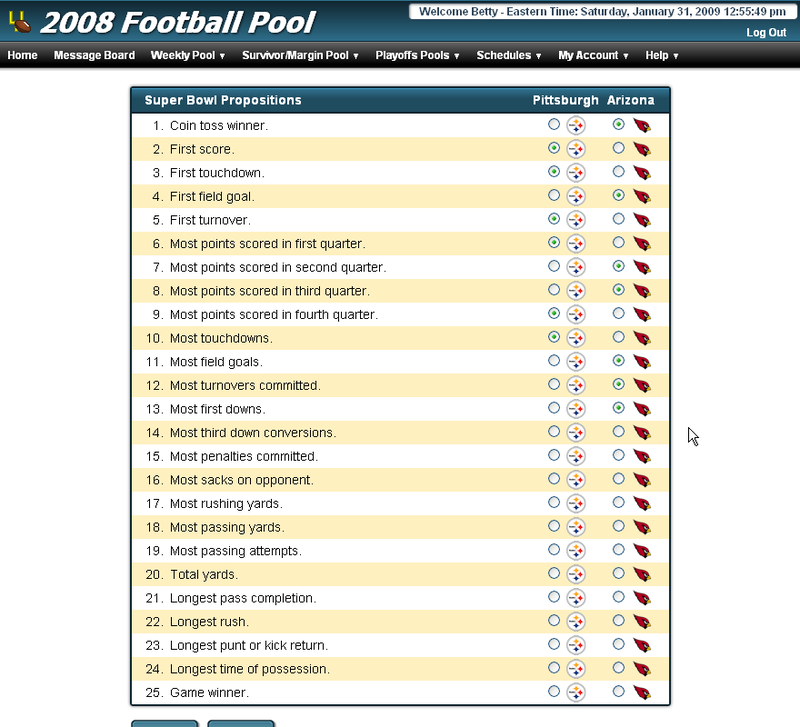 The application includes help pages that explains the pool rules in more depth. They are automatically tailored to cover the specific pool options you have set. Be sure to read the special Administrator sections on those pages before attempting to run a pool.